We’d love your help. 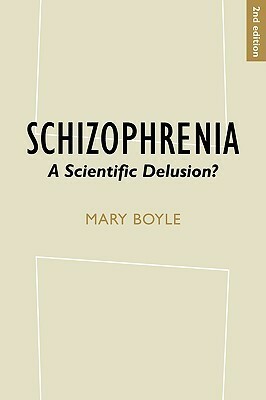 Let us know what’s wrong with this preview of Schizophrenia by Mary Boyle. To ask other readers questions about Schizophrenia, please sign up. Mary Boyle is Professor of Clinical Psychology & Head of the Doctorate in Clinical Psychology at the Univ. of East London. Her credentials are important due to her topic and more importantly her conclusions. She takes on Schizophrenia, she asks and explores whether or not this is a real condition. She does not deny that some people behave oddly and some in rather bizarre ways, but is there a disease, a brain malfunction that we can scientifically label as schizophrenia. This book at times is Mary Boyle is Professor of Clinical Psychology & Head of the Doctorate in Clinical Psychology at the Univ. of East London. Her credentials are important due to her topic and more importantly her conclusions. She takes on Schizophrenia, she asks and explores whether or not this is a real condition. She does not deny that some people behave oddly and some in rather bizarre ways, but is there a disease, a brain malfunction that we can scientifically label as schizophrenia. This book at times is rather difficult to read, you must force yourself to plow through the details of several studies and analysis. However, she reveals (once again I might add) that we do not know what we think we know and when it comes to explaining human behavior we know even less. She touches on a very interesting connection in the work of Dr. Kraepelin, who first introduced the concept of dementia praecox, the forerunner of schizophrenia and Dr. von Ecomono’s work and description of encephalitis lethargic. There was an outbreak of this little know viral disease during the time Dr. Kraeplelin was doing his research. In fact there were several known cases of misdiagnosis where one was thought to be suffering from dementia praecox but instead a correct diagnosis was given when it was discovered that they were suffering from encephalitis lethargic. The worst chapter (because it was technical, sluggish and downright boring for me anyway) was the one on genetic research as it relates to schizophrenia. The chapter on supporting & maintaining schizophrenia was very interesting and Mary Boyle pulls no punches especially as she explores two areas. The first was defining and defending mental illness & disorder. She here simply takes to task those who want to argue that mental illness really is a disease in a medical sense. Secondly she then moves on to discuss the question as to why and to whom is schizophrenia reasonable and desirable. She states, “The crucial differences between medicine & psychiatry can perhaps best be summarized by saying that whereas medical scientists study both bodily functioning & describe patterns in it, psychiatrist behave “as if” they were studying bodily functioning and “as if” they had described patterns there, when in fact they are studying behavior and have “assumed”—but not demonstrated—that certain types of pattern will be found there.” She goes on to talk about how psychiatry, the public and families of the disturbed actually desire schizophrenia and need to believe that it is an actual disease. Get the book, one day you will want to read it hopefully you will never have to read it.